SAN DIEGO — With picture-perfect views, San Diego appears to be a flawless place to live. However, with the average rent for an apartment around $2,000 and the cost to purchase a home around $600,000, America’s finest city loses some of its appeal. Allen is a former Navy rescue diver, swim coach, husband and dog dad who fell on hard times because of a bad motorcycle accident. Allen isn’t alone. During a weekend meet-up, around 300 vans and van-lifers packed Fiesta Island in California to explore each other's vans, and discuss life on the road. The "van life movement" has made a mark on social media. The hashtag #VanLife has been used more than 4 million times. 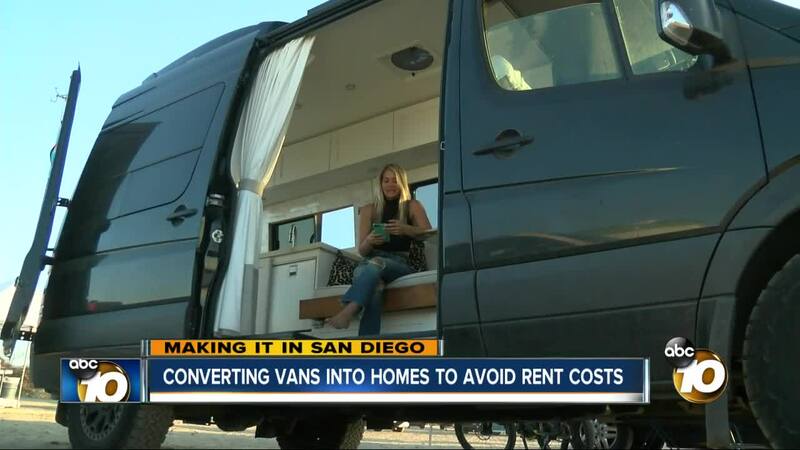 Even though the movement is growing in popularity, sleeping in your vehicle on city streets in San Diego isn’t allowed. Those who do it are willing to risk a ticket or have to move around from location to location. Currently, there is a lawsuit filed against the city of San Diego pushing for a lift on the ban against people living in their vehicles and parking on city streets for long hours. The city declined KGTV's request for comment because the matter is ongoing. “A lot of people are downsizing," Acio said, "and they are putting their lives first and doing things they thought they could only do when they’re 65 and retired."